The #1 church website & ministry marketing platform for increasing new visitors, members, clients, and volunteers. NetMinistry is the most trusted brand for churches, ministries, and Christian businesses of any size. We provide you with everything you need to build, advance, and market your organization online, generating more website traffic, supporters, and revenue than any other service. We're the one team and technology your church or ministry needs to grow. Don't Build Your Own Church Website. 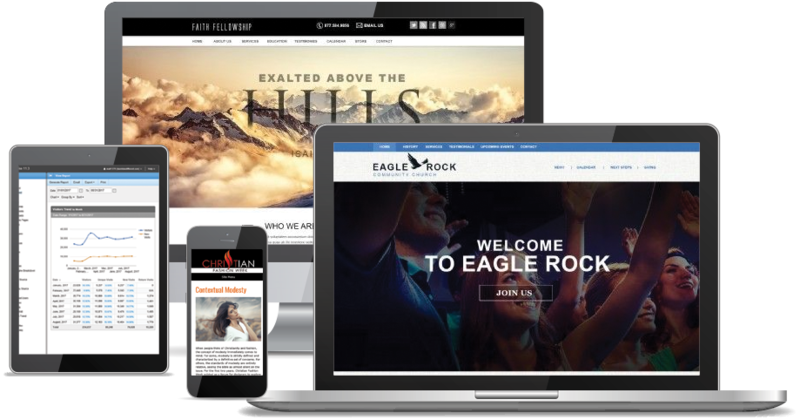 Let us work with you to plan, build, and launch your ministry or church website. No more home-made, do-it-yourself websites! Don't Update Your Church Website. Most church & ministry websites are out-of-date within months. Hire us to manage and update your website for you. Don't Promote Your Church Website. In order to attract more visitors to your church and more donations to your ministry, hire us to market your website to the world. "I can't tell you how great (and accommodating) you guys have been in this process. There have been other firms that we've explored but none as professional and personable as yours." "Thank you so much for all that NetMinistry presents to ministries like mine - to be able to have a great website for spreading the gospel. What a delight to be with you!" "I want to take a minute to express my gratitude to you and your staff for the incredibly competent way you do your work for the Lord." "Our church website is now live as of last Friday and I continue to be impressed with many of features in the CMS... "
"Your excellent professional and inspired work has enabled our writing, design and photographic skills to grow and to be showcased in a manner which has gained attention all over the world..."
"You do not know how much I appreciate your help today. You really went above and beyond. I know you worked past your regular workday on this and I really want to thank you." Complimentary advice and direction for churches, ministries, and Christian businesses.